This past April, I mentioned a number of concerts I would be attending this summer. A few more have been announced/come to my attention so I thought I’d provide an update as to who I’m going to see this summer. Here’s my complete dance card! Less than a month away! This was the second concert I had lined up this year and Scorpios are one of my all-time faves so I’m pretty excited about it. Cinderella’s great too, I just wish they had some NEW material to play. Finally bought my tickets for this last night. It’s all general admission so there was no rush to get’em, even though they’ve been on sale for close to month now. In addition to Sammy Hagar playing on another night, Buckcherry and Bret Michaels were recently added as headliners for the nights they play and Cinderella is now playing a date too (not as headliners though). I would love to see all three of them but I’ve seen Buckcherry three times already, saw Poison last summer and I’ll be seeing Cinderella with Scorpions, so I gotta go with Alice! I’ve wanted to see him forever, he’s one of my favorite acts and the fact that I’ll see Tesla too is a really cool bonus. First concert tickets I bought for 2010. I just saw the set list for the tour and I’m kinda disappointed because it mostly focuses on their music from ’90s through today. It’s understandable since their last tour was built around their ’80s catalog but for this being my first time seeing Maiden, I wanted all the signature songs! I actually like this band a lot, at least when it comes to their “hits”. I have one of their albums and two greatest hits. Lawn tickets were only $7 so I figured why not? Should be fun. Haven’t bought the tickets yet (they go on sale next Wednesday but I won’t be able to buy them until the Wednesday AFTER next Wednesday) but I’m really excited for this show. Tickets are pricey but it’s AEROSMITH! With Sammy Hagar! I don’t want to pass up seeing Aerosmith at least once in my life. Another $7 lawn seat ticket. Ted’s a really cool guy but he’s another act I’m not all too familiar outside of his signature songs. Still, I think it should be a fun show. Haven’t bought these tickets yet but I will the same time I buy the Aerosmith tickets. So that’s my summer concert series! Should anything else pop up, I’ll be sure to report on it here and I’ll definitely be doing my concert reviews for each and every one of these shows. I can’t remember if I mentioned it already but I bought my few concert tickets for 2010 a month or two back. I’ll be heading off to DTE Energy Music Theatre in Clarkston, Michigan (for my fourth time) to see Iron Maiden and their special guests Dream Theater on July 17th! Should be a great show. I like Dream Theater but the real draw for me is Iron Maiden. They’re one of those bands that’s been on my unwritten “must see live” list forever. Well, I have some more good news to add to that. Today I found about THREE great acts coming to area. Here in downtown Lansing, there’s the week-long Common Ground Music Festival that takes place every summer. This will be the festival’s 11th year and in the past they’ve featured acts like Sammy Hagar, Snoop Dogg, Sheryl Crow. Last year, Stone Temple Pilots were one of the headlining acts. Alice is another one of my all-time favorite acts and just recently I had been complaining about how he never seems to get close enough to Lansing or Detroit (though he almost always pops up in Michigan somewhere during the summer every year). I noticed the newspaper this morning talking about Common Ground and they mentioned Alice will be performing July 16th and it will be full of his usual theatrics. And the icing on the cake? Well, Tesla will also be performing on the 16th! Hagar performs on the 14th and I’d like to see him but Alice alone is enough to win out over Hagar and when you throw Tesla into the mix, it’s a no-brainer that this is the year I need to shell out $30. Heck, even if Tesla wasn’t performing, just seeing Alice is worth the money, in my opinion. Common Ground still have a number of slots to fill and promises more artists to be announced but I can’t imagine anyone topping Alice Cooper! Tickets aren’t on sale yet. I think they go on sale next Wednesday and I’ll definitely be picking two tickets up then. So what a great weekend I’ll have! 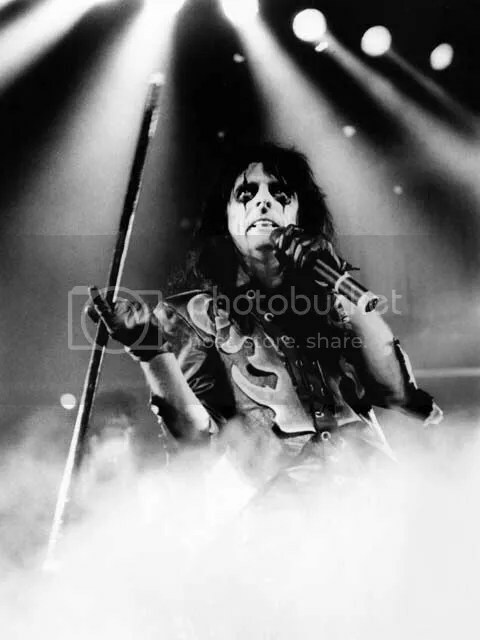 Friday, July 17th: Alice Cooper & Tesla. Saturday, July 18th: Iron Maiden & Dream Theater! I received confirmation earlier this afternoon that the Scorpions will be storming the stage of DTE on July 1st! Tickets go on sale this coming Saturday morning (gee, thanks for the heads up!). Ratt, Cinderella or Dokken are opening most of their shows but as luck would have it, the DTE show is one of the few where there is no opener. Oh well. I would’ve love to have seen Ratt but I won’t complain about an extended show from the Scorps! Scratch another all-time fave off the “must see” list. July is going to be a great month for me! Do YOU have any concert plans for the summer? Ah, so my summer of music finally kicks off and it was a good show by all three bands. Unlike with Cruefest last year, we had pavilion seats this time, so it was nice not to have to stand up or sit in the lawn the whole show if I didn’t want to. Plus the show started at 7PM, so the sun wasn’t as strong and clouds were coming and going to keep things from getting too warm. We had perfect seats. The middle of the center section, right behind the soundboards. It was pretty cool to look at all the gear and watch the tech guys do their thing (plus I got to see the setlists, though I already had a good idea what to expect). Between lawn and pavilion seating, DTE can hold about 15,000 people. The turnout was solid (I estimate around 7,000) but nothing spectacular. It wasn’t a sellout like Cruefest was but the crowd was, expectedly, way different. Cruefest appeals to a younger crowd that is much more likely to use their money on a “rock ‘n’ roll show”, while Priest and ‘snake brought in a crowd of 30, 40 and 50 year olds (I even saw a few people who looked to be into their 60s!). But let me tell you, it was a very vocal enthusiastic older age bracket. I was planning on buying Whitesnake and Judas Priest tour shirts (Didn’t just want a logo shirt, I needed commemoration!) online, but the entrance we went in had no line at all for the merchandise shop, so my girl convinced me to get a Priest shirt now so I wouldn’t have to pay shipping later. I decided on the “Welcome to the Home of British Steel” tour shirt. I’d show a picture, but maybe it’s really new because their own online mechandise shop doesn’t list it. I’ll still have to pick up a ‘snake shirt though. When I found out over a month ago that this Grand Rapids, MI band was going to open, I quickly went to their MySpace page. I really like the band name and they have a really cool logo, and some of the guys have a cool look to them, but I didn’t like the music at all. It’s standard “post-grunge” hard rock. If you’re a fan of Theory of a Deadman, Nickelback, Saving Abel, etc., you’d like Pop Evil. At the time of listening to their page, “Hero” was a mild radio hit, but I guess “100 in a 55” is a top ten rock radio song now, so the small crowd that was there so far enjoyed it. Tickets said the show was to start at 7PM, but Pop Evil hit the stage about 6:40. The crowd was extremely small at this point. Lead singer Leigh Kakaty (who kinda reminds me of Stephen Pearcy, not for singing, but just the way he looks/acts) did a good job of getting the still tiny crowd into the act and bassist Matt DiRito put on a great show as well. Kakaty walked all the way up into the lawn and sang “Hero”. The Good To Be Bad World Tour has slithered into Clarkston! I was happy to see we got TWO songs from Good to Be Bad (they could’ve played that whole album and I would’ve been fine with it). I guess they’ve been switching off on between “Best Years” and “Fool For Your Loving” at shows. I think we got the better deal with “Best Years”! I’ve always thought “Bad Boys” and “Cryin’ In The Rain” were just okay songs, but they sounded great live. This is perhaps the best Whitesnake lineup David has ever assembled. Doug Aldrich was just amazing and I really enjoyed the dual solo he did with Beach (though Doug definitely outshined Reb). I know some people get bored with solos, but to me, it’s always fantastic to watch great musicians get spotlighted, especially with DTE’s video screens. We got tons of closeups. Coverdale’s voice was great. I think the whole Good to Be Bad album is some of his finest recorded performances, but I wondered how much of that was studio work. The answer is not very much, if any at all. That guy can WAIL!!! I can’t complain too much about the set list, though I would have traded “Bad Boys”, “Is This Love”, “Cryin’ In The Rain” and “Here I Go Again” for “Don’t Break My Heart Again”, “Walking the the Shadow of the Blues”, “Ready to Rock” and “Slide It In”. Coverdale mentioned that this year was the 25th anniversary of the Slide It In album… but they didn’t play “SLIDE IT IN”!!!! >=( That’s one of my favorite Whitesnake tunes. By the third song, pretty much everyone who was going to show up was there. I wasn’t sure how people would react to Whitesnake (thinking maybe most were there for Priest) but the crowd definitely knew and appreciated Whitesnake! And now for the British Steel 30th Anniversary Tour! I have to be honest, British Steel isn’t really a Priest favorite of mine. There are some classics on that album, but overall, I’ve never been a huge fan of it. I would have much rather heard the “hits”, since this was my first Priest show, but you take what you can get. For what it was, it was a very good show. Rob moved around and didn’t hang his head the whole show, so that was good and the crowd really popped when he’d start wailing. “Breaking the Law and “You’ve Got Another Thing Comin'” went over the most, but “Prophecy” got a pretty good reaction too. I really loved hearing “The Rage” live. They had a really cool set up with the smoke, lasers and changing backdrops. Overall, this entire concert gets a big thumps up from me. Pop Evil was decent, Whitesnake was great and Priest was too, they were only hindered by the setlist, in my opinion. Well worth the $32.50 or whatever I paid for. If they’re coming to your area, check ’em out. I've got rock 'n' roll pneumonia! I ordered my Judas Priest/Whitesnake tickets for the July 15th show at the DTE Energy Center in Clarkston, MI, and… I got my tickets in the mail for the Def Leppard/Poison/Cheap Trick concert on July 24th at the very same venue! In a paycheck or two, I’ll probably pick up the tickets for the August Nickelback/Papa Roach/Hinder/Saving Abel show, also at DTE.